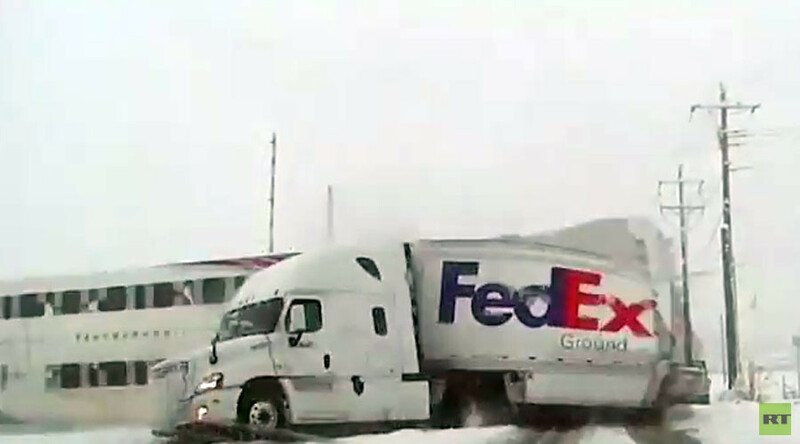 Shocking footage captured in Utah shows the moment a double-decker passenger train violently smashes through the back of a FedEx semi-trailer, as severe ice caused barriers and safety signals to fail at a busy railway crossing. Dashcam footage taken by North Salt Lake Police on Saturday shows the moment the train smashes through the articulated truck, splitting the trailer in two and sending its contents flying through the air. Somewhat miraculously, neither of the two people in the truck nor any of the 82 passengers on board the train was seriously injured. “Preliminary information indicates the gates were affected by the severe ice and snow conditions at the time and were in the default ‘down and active’ position, as they are programmed,” the Utah Transit Authority said. The investigation is ongoing.